Happy New Year!! Did you break your resolution already? The hubby asked me about my New Year’s resolution today, as I blurted out my response, I quietly realized it’s the same resolution I set for myself last year. Ouch! Why is it that achieving a New Year’s resolution is so hard for me?? I’m hoping maybe this year will be different… I’ve got a few goals and plans in place so we shall see! Part of Two Frugal Gals goals for 2014 is to continue to explore creative ways to live frugally and hopefully in the process inspire you and others to do the same. After all, who doesn’t want to save money, right? We just want to say a BIG thank you to all the wonderful people who are following our blog and sharing in our crazy and frugal adventures. We can’t wait to see what’s in store for the new year. So Happy New year and here’s to achieving the goals you set for yourself in 2014! 1 (8 ounce) package milk chocolate candy kisses, unwrapped. Preheat oven to 175 degrees. Arrange pretzels on a baking sheet. 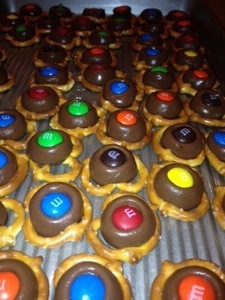 Place a candy kiss on the center of each pretzel and warm pretzels in the preheated oven until candy kiss is shiny and slightly softened, about 2 minutes. 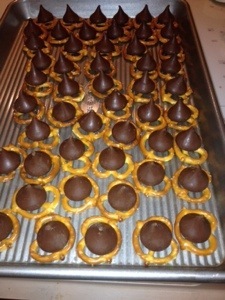 Note: the kisses keep their shape when melted so don’t wait for them to ‘puddle’ onto the pretzel like I did it makes a big mess. When they are shiney take them out of the oven. 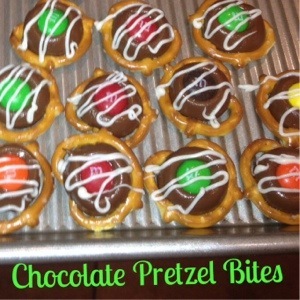 Place a candy-coated chocolate piece atop the candy kiss on each pretzel; press down to mold it to the pretzel. Chill in the refrigerator for 10 minutes.